On the 30th, October, 1834, and Act for the sale of the real estate of Robert Huge Munro and Caleb Dickenson was read and passed on November 6. By this Act, the Trustees were given power of sale of the real estate and slaves of Robert Hugh Munro and Caleb Dickenson for investing the funds and applying the same to the purposes of their wills and for no other purpose. The Trustees were appointed to select a convenient and healthy site or sites within the former limits of St. Elizabeth for erection of a school or several schools for poor boys and a school or several schools for poor girls and for an Alms House. In 1856, a Free School for boys was opened near Black River and early in 1857, the premises of Potsdam in Santa Cruz Mountains were purchased and the school removed there. The girl's school was first opened at Mount Zion in 1874 and on the 1st January 1885, was removed to Malvern House and then to Hampton. By Law 34 of 1879, the Jamaican School's commission was empowered to make schemes for management of secondary schools. The Munro and Dickson School came into operation on 1st January 1891. This was amended in February 1903. The existing Trust was removed and the future Trust was made of the Custos and the Chairman of the parochial Board of St. Elizabeth and Manchester and five persons appointed by the Governor on the nomination of the Jamaica School Commission. The Scheme was again modified in 1937 and again in 1949 saying no member of staff could become a Trustee and limiting the number to no less than seven or more than nine. Munro College is an imposing School situated predominantly on a hill in Potsdam, contributing significantly to the character of the area. The present dining room was built in 1925 as an Assembly Hall. It functioned as the fifth form until 1938 when it began being used as the dining room. The dining room is constructed with random cut stones up to two floors high with 3' x 5' (900mm x 1500mm) with sash windows throughout. Four 12" (300mm) wide tuscan columns are used to hold up the floor of the balcony, which pronounces the entrance of the dining room. Inside the structure is a column and beam grid information with two rows of three 10" (250mm) columns in the dining area. On the west side of the building is an elevated platform/stage, while on the south end, is the cafeteria. The building is adjoined to the Coke-Farquharson Building and is the oldest part of the school being originally what is left of the coffee great house when the estate produced coffee. This is the most beautiful building at Munro. Prior to its construction students worshipped in one of the form rooms or at St. Mary's Church. The project to build a church was initiated by Miss E. Scottie Wright, Matron of 40 years. Funds for this building and beautification came from Sunday offerings, donations from parents, friends, Old Boys, and the tuck shop. The plans which were made by Canon Melvilles were inspired by the Church in which Miss Wright used to worship in England. In 1911, the foundation stone was laid. In 1912, before the Chapel was finished a scheme was entered upon whereby every boy could purchase a pew (for 4p) on which his initials would be carved. 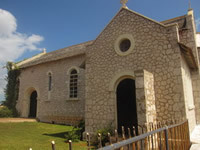 The Chapel was dedicated to "All Saints" in March 1914, by Bishop de Carteret. In August 1918, Mr. Walter Wooliscroft presented the central stained glass window. Windows for the other areas of the Chapel were given by Miss Wright and parents of the Old Boys and some were procured through a memorial fund in honour of those Munronians who had fallen in. The Chapel is constructed predominantly of cut stone. The Terman Building is also known as the "Baby Dorm". 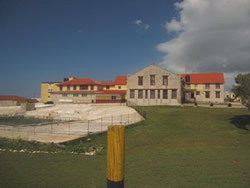 The building is called the "Baby Dorm" because it houses first form boarders of Munro College. "The Baby Dorm" is a two storey randomly laid cut stone building with sash windows approximately 3' x 5' (900mm x1500mm) which are used throughout the façade. There is a central wooden staircase at the front that leads to the first floor, the landing of which is supported by five 4"x 4" (100mm x 100mm) timber post that goes up to the underside of the zinc roof. The gable roof has a parapet approximately 1' 6" x 8' at the same pitch/slope of the existing roof. On top of this parapet are three 8" x 8" x 1' 6" high (200 x 200 x 200 x 400mm) concrete columns on the parapet, one on either side of the edge of the gable-end, and one in the centre/ridge of the parapet. This is repeated on the opposite side of the "Baby Dorm" which is presently attached to a contemporary building.